Magnificent Gold Horse Pin – Save Over $1,250! You are here: Home / antique / Magnificent Gold Horse Pin – Save Over $1,250! Normally, we don’t talk much about the tremendous sale prices on horse jewelry that we offer, but in this one instance, we simply COULD NOT make an exception. This 14K Gold Happy Stallion Pin is absolutely going to make someone’s holiday — will it be you? This is an exciting, dynamic pin, with the stallion’s movement captured in exquisite 14K gold. Look at the flying hooves, the diamond studded mane and tail flowing freely behind! You can almost imagine the thunder as he crosses the pasture, the powerful hindquarters beating out freedom’s exhilirating song. Festive and unique, this pin measures an inch and a half wide and an inch and a quarter tall: the perfect size. It’s big enough to make a statement, small enough to be appropriate in almost any setting. This stallion would look right at home, galloping across the lapel of your blazer. Bring some of your passion, energy, and free spirit into the office with you, that vitality that separates you from teh rest. Ruby eyes shine bright, adding the perfect touch of color. Very versatile, you can wear this for a casual event or an artistic outing; the possibilities are limitless! Best of all, because we want every horse lover out there to have the perfect gift under the tree, it’s on sale. Normally, you’d pay $2,100 for this pin, testament to the quality, workmanship, and unique styling here. High quality gold horse jewelry is hard to find! 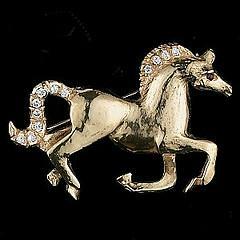 But now, this beautiful gold horse pin can be yours for only $850 — a savings of $1,250 — mor than 50% off! Of course, quantities are limited, so you’ll want to act fast. With the holidays approaching and budgets tight all over, you can still make your horse lover’s shiniest dreams come true. 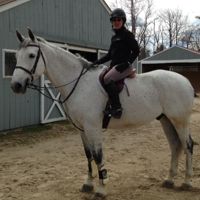 Shop early, and visit EquestrianJewelry.com for one of a kind vintage and estate pieces, stunning gold horse jewelry, shiny silver horse jewelry, and more. We make giving easy — and if you start now, you can make it memorable!